A few weeks ago, the Voyager 2 spacecraft beamed back the first hints that it might soon be leaving the heliosphere — the giant bubble around the Sun filled with its constant outpouring of particles, the solar wind. In the past few days, we have received even more clues to suggest that that time seems to be on its way. Back in October, we saw a spike in the counting rate of particles detected by the High Energy Telescope of Voyager 2’s Cosmic Ray Subsystem, or CRS. The CRS High Energy Telescope detects high energy particles that come from outside our heliosphere. A rapid increase in the number of particles counted over time — that is, their counting rate — gave us the first hint that we were getting close to our heliosphere’s boundary, where these interstellar cosmic rays sneak in. The new data that scientists are talking about comes from the Low Energy Telescope, another CRS telescope on both Voyager 1 and 2. It shows the counting rate of lower energy particles that typically originate within the heliosphere. The counting rate of these particles declines as they approach the heliopause and ultimately drop to near zero at that boundary, where the particles can escape into interstellar space. 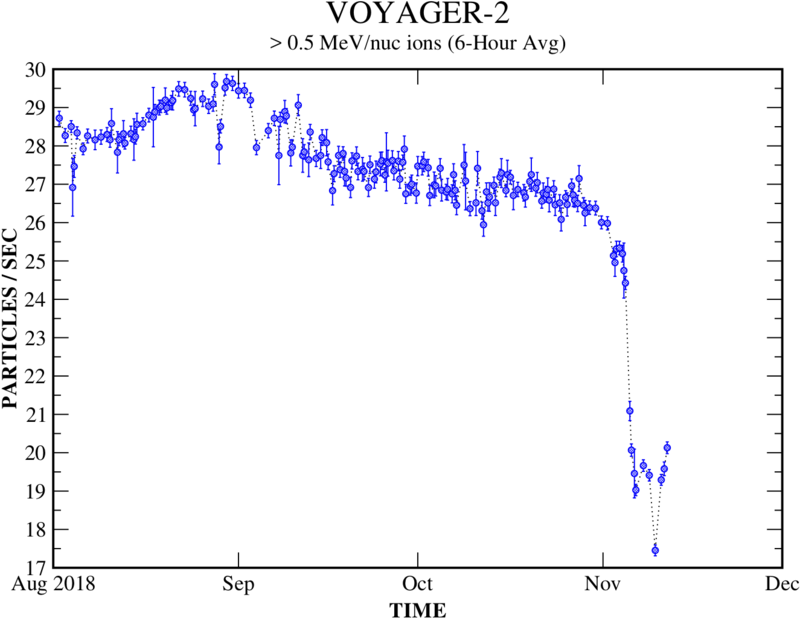 In the following graph of the Low Energy Telescope data, right around the beginning of November, you’ll notice a pretty dramatic change: All of a sudden, the Voyager 2 counting rate of low-energy particles dropped, although it hasn’t yet dropped to nearly zero as it did when Voyager 1 entered interstellar space. Scientists will keep their eye on these graphs as one of several indicators to determine when Voyager 2 truly passes outside of the heliosphere. Once there, Voyager will be poised to share all new data about the nature of space between the stars. The vertical axis is the count rate for the heliospheric particles, or how many low energy particles are being detected by the Low Energy Telescope of the CRS every second. The horizontal axis is time, starting in August 2018 and going to November 12th, 2018. However, note that the vertical axis is zoomed in, and stops at 17; while this is a big step in the right direction, the counting rate isn’t yet near zero, which is what we would expect if Voyager 2 was out of the heliosphere. Voyager 1 data from 2012-2013 is shown in the red lines, with time shifted by 6.32 years. The Voyager 2 data from this year is shown in blue. 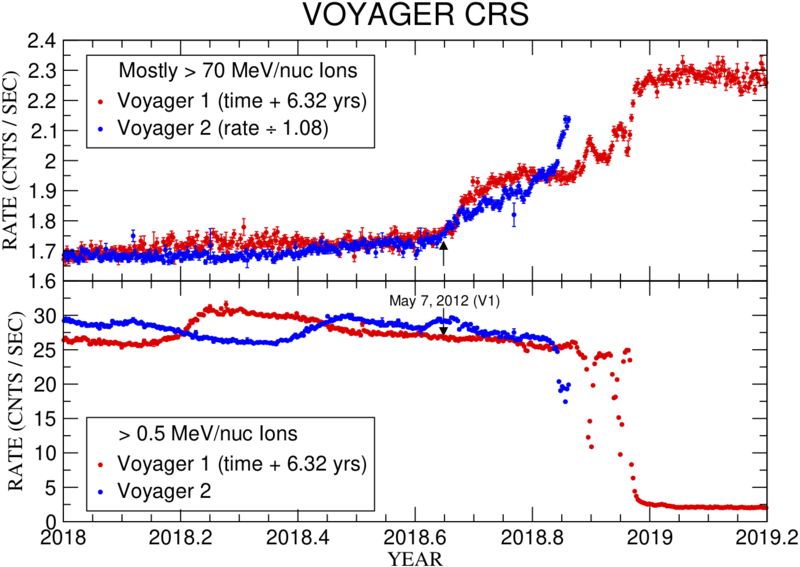 As you can see, the High Energy Telescope of the CRS on Voyager 2 has been steadily increasing since October 2018, but the past few data points have shot up faster than expected. This loss of heliospheric particles and gains in interstellar particles is expected when leaving the heliosphere, exciting scientists that Voyager 2 is close to crossing the heliopause. We’ll wait in anticipation to see the path Voyager 2 is taking, closely monitoring the data it sends back. Keep following the Sun Spot to get updates on the data we receive for Voyager 2, and check out JPL’s Voyager and GSFC’s Voyager websites to learn more about the Voyager missions.